Forever 21 is a popular fashion retailer chain in America, headquartered in Los Angeles and operating all over the world. They are known for their affordable prices, frequent sales, and trendy styles. If you are interested in working at Forever 21, keep reading to find more information about how to apply for jobs at Forever 21 below. The company got its start in 1984, when founders Do Won Chang and Jin Sook Chang established the first store (named Fashion 21 at the time) in Los Angeles, California. This original store is still in operation today. While it was originally targeted at the Los Angeles Korean American community, but they soon spread their marketing to other demographics, and the company grew quickly. Forever 21’s website cites a desire for hard-working, talented people, and encourages applications from anyone who might be interested. While the company has seen incredible growth over the last 30 years and has big plans for the future, their About page still insists that they are a family business, with the values and priorities that implies. 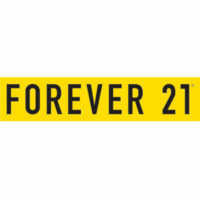 Since its start in 1984, Forever 21 has grown to become the fifth largest specialty retailer in the American industry. There are over 600 stores operating throughout the Americas, Asia, and Europe, and they hope to double that number in the next three years. With such growth on the horizon, the company is always hiring, so if you are interested in a career with Forever 21, apply online through their website today. Forever 21 is a large and growing company; as such, there are a plethora of job opportunities at all levels for those seeking employment. Retail positions range from entry-level sales associate jobs to assistant manager and store manager positions. All of these are involved in the day-to-day running of the store. Current local job openings can be found through the careers link on their website. There are plenty of corporate careers available at Forever 21 as well. These include district or area manager positions, product development positions, IT service positions, and more. Corporate Forever 21 jobs are also handled through their online portal, where you can filter searches by locations, department, and job description, as well as submitting your direct application for free. You must be at least 16 years old to apply for Forever 21 jobs, but most of the time they prefer to hire applicants with at least a high school diploma or GED or above. Store hours vary by location, but generally stretch from mid-morning to mid-evening, with occasional late hours. A flexible schedule is important when pursuing Forever 21 careers. Forever 21 offers a comprehensive benefits package. Their employee health insurance includes dental, vision, and a flexible spending account, as well as disability and life insurance. Qualifying employees are eligible for a 401(l) retirement plan, performance bonuses, and paid vacation time. Sales Associate – The quintessential entry-level job. Sales associates are responsible for the day-to-day operations of the store. They must greet and interact with customers, answer customer questions and offer advice on store products, conduct financial transactions quickly and accurately, and maintain the appearance and organization of the store. Sales associates make minimum wage to start out and are eligible for raises when appropriate. Store Manager – Store managers are responsible for the higher up functions of the day-to-day running of the store. They recruit and schedule sales associates, make sure the store is clean and properly laid out, oversee loss prevention and daily merchandising, and more. Salary for store managers averages around $50k per year. Visual Merchandiser – A visual merchandiser is responsible for developing floor plans and displays in order to maximize sales of Forever 21 products. They must be creative and have an understanding of how customers’ attention is directed and engaged. Visual merchandisers make an hourly rate of around $13/hour, though it may vary depending on experience. Product Developer – Product developer responsibilities include researching magazines, competitor’s websites, and runway looks to stay current on emerging fashion trends, communicate and facilitate relationships with buyers and producers, transfer design ideas onto development sheets, and more. Product developers must be creative, personable, and hard-working. A successful product developer’s salary is around $55-60k a year. Tell me about a time you disagreed with your boss. The interviewer wants to explore whether you are able to work effectively in a team. The ideal answer finds the balance between being too much of a follower, and being a disruption to the team. Be honest – if the last time you disagreed with your boss ended poorly, explain why and how you would improve on the situation if given another chance. What are your career goals? This question is meant to figure out whether you are planning to stay at Forever 21 for a long time, or if you are planning to move on as soon as a more appealing job presents itself. Vaguer answers are better for this question; rather than talking about specific jobs or positions you want to reach, talk about aspects of the job that you are interested in that match up with Forever 21 jobs. What gets you up in the morning? The interviewer is interested in your motivations. What is it that interests you about the job? How enthusiastic a team member will you be? What might you be interested further up on the career ladder? Be honest, but be careful not to sound like the job you are currently interviewing for wouldn’t satisfy you. Talk about the aspects of it that you do find satisfying, even if your ultimate goal is higher up. How do you handle pressure? This question can be taken pretty much at face value. The interviewer wants to know how you handle stressful situations, and that you won’t fall apart when faced with a problem. General strengths are good if you can state them quickly and concisely. Alternatively, give them an example of how you handled a stressful experience in a previous job. Tell me about a time you exceeded expectations. The interviewer wants to know that you are creative and proactive, and that you won’t just put in the bare minimum effort. They may also be looking for information about what excites you and what kind of work you gravitate towards once you get outside the bounds of the job or assignment description. Forever 21 does not have a printable application form; much like many contemporary companies, all applications are handled through the Forever 21 jobs online portal, available through the Careers link on their website and the link at the bottom of this article. The lack of printable application for Forever 21 makes the collection and organization of Forever 21 application materials easier for all involved. The website contains instructions for how to apply for Forever 21 online, but they basically boil down to making an account and password, then searching for jobs that you are qualified for and interested in. You can sort by many different metrics, then put in your free application to as many opportunities as you like. You cannot download application form, but the website will record each Forever 21 application you submit. It doesn’t hurt to stop by the store and introduce yourself, however; having a face to put with the name on your application can make the difference between you and another equally-qualified candidate. Once your Forever 21 job application online has been reviewed, you may be contacted to schedule an interview at a local location, whether a store or an office. Make sure you have nice, formal clothing for your interview. It’s better to over dress than under dress, so err on the side of too formal. Bring your resume printed on quality paper as well, as a reference or something to leave with the interviewer. Prepare answers to the above questions in advance, and also bring a few questions of your own – most interviews end with a chance for you to turn things around. Above all, be polite and positive, and thank the interviewer for their time at the end of your appointment. It’s not a bad idea to also send a follow-up e-mail a couple of days later, reiterating your interest in the job and asking any questions you forgot to during the interview. Best of luck!